Niagara Falls has the Maid of the Mist, and it's a thrill to take a boat into the heart of the horseshoe. 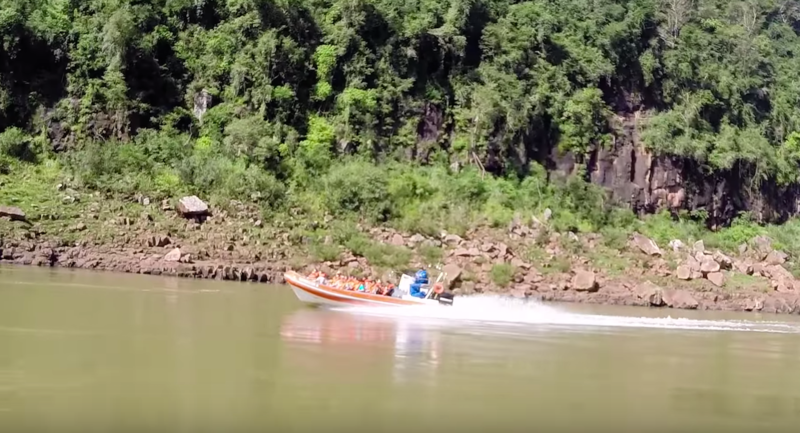 But when visiting Brazil, our Iguazu Falls Tour took a boat ride to a whole new level! The Jet Boat Safari starts with a short jungle tour out to the Iguazu River where you board a boat and head out to the base of the falls. You actually go right underneath Iguazu Falls. Check it out. Our Jet Boat safari was by far the most thrilling of all our Iguazu Falls tours. It starts off with an relaxing drive through the jungle, followed by an easy jungle hike that takes you to the launching point. Don't worry about your valuables or non-waterproof equipment, there are lockers where you can store everything away. Once you are finished, there is a place to change where you can dry off and get ready for the next adventure. Insider Tip: Bring a towel and a change of clothes you are going to get wet! Having a Blast at Iguazu Falls! Make sure to pack your GoPro and a waterproof camera. Keep everything firmly fastened and hold on for one of the most fun adventures you'll ever have. The drivers are experiences, safe and qualified and they take you through the rapids, into the heart of the falls and right underneath the powerful cascade. This is the tour of all tours. 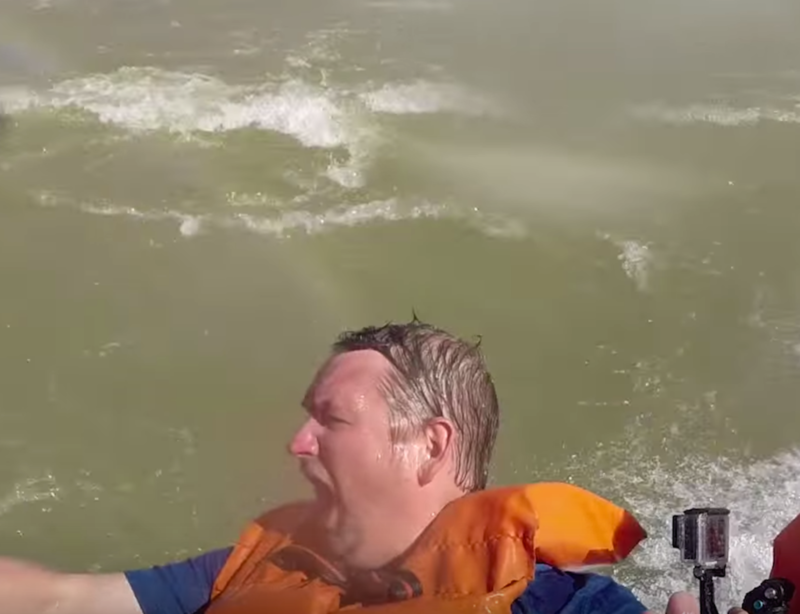 So when you visit Iguazu Falls, make sure to book a jet boat safari to see the water up close and personal. We stayed at the Belmond Hotel Das Cataratas in the heart of the National Park. This place is worth the splurge as it gives you access to the waterfalls before and after the park closes. All you have to do is walk across the street and you are at Iguazu Falls. We went at both sunrise and sunset and had the falls all to ourselves. 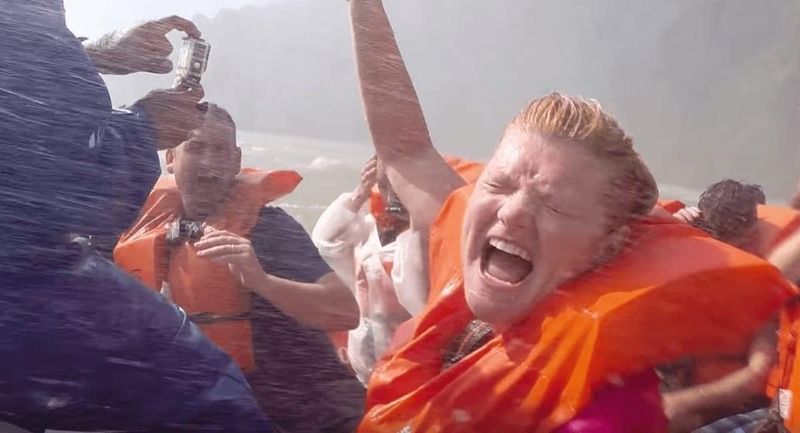 23 Responses to "Getting Soaked – The Ultimate Iguazu Falls Tour"
I liked the video, congratulations. I always do the same boat trip when I go in Foz and the landscapes are magnificent. 1) Is the Belmond Hotel trail /walk the same the one all visitors goes to? Hi Penny, yes visitors that go to the park can access the same trail, but by staying at the Belmont, you can access it early as the park doesn’t open until 9am (I believe) we were out for sunrise and had it all to ourselves. We also had sunset to ourselves as well. Most visitors don’t get to see as much if they aren’t staying at the hotel as its a pretty long walk and people arriving by busses or tours have a limited time. We had all the time in the world. A ticket isn’t required if you are staying at the hotel. Once you are in the park, you are free to roam wherever you like. But you will be stopped at the security gates when entering. The Iguazu Falls are absolutely beautiful. You can get really close to the falls through structures on both sides. If you’re ever in South America, definitely worth the trip. Thanks Douglas. We’ll definitely have to see the falls from Argentina next time. The Visa fee was a bit much for us to justify a visit of just a few hours, but when we go back to Argentina, we’ll be sure to make the trip. Iguazu is one of best waterfall when i seen,great shots.Thanks for sharing amazing experience.. Thanks! I hope you get there too. Right now there are some great deals to Brazil leading up to the Olympics. So much fun!! We did this on the Argentina side of the falls. Luckily we did it at the end of the day so we could head straight back to our hotel after the full saturating experience! ? good call doing it at the end of the day. If you aren’t prepared, you will be stuck being pretty soaked for the rest of the day. It was hot while we were there so the water was very welcome. That looks so fun! How much did the jet boat tour cost if you don’t mind me asking? Hi James it’s 199BR which is about $50 US. We did it on a tour with Cassinotur which was good because everything is pretty spread out in Iguazu. Having a driver take you from place to place is good. There’s the park entrance fee as well which is about $20 per person. Iguazu Falls is one of the most amazing waterfalls on earth! I don’t know of any other waterfall where you are completely surrounded by the waterfalls on four sides. Incredible place!!! We absolutely loved it. A must see if you are in Argentina, Uruguay, Paraguay area. We wrote about it on our blog as well. Love your photos of each other… too funny! Thanks for sharing Shirley, I’ll check out your blog. We wanted to go to Argentina to see them but we couldn’t justify the $150 per person reciprocity fee (for Canadians) to see the falls for just a few hours. We found that it was beautiful enough on the Brazil side and maybe next time we go to Argentina and spend some time there we’ll check out the Argentina side. We also wanted to pop until Paraguay as well, but it was another $130 Visa fee per person for us. It’s too bad they don’t waive the Visa fees at the border and let people cross if they are on a tour. I think that would be great for all the countries involved. I Agree, Iguazu Falls is extraordinary. It just goes on forever! Yep, it’s a great place to enjoy anytime! Wow amazing!! looks like a great place to have fun… It seems like you had a good time at Iguazu falls.. It is a great way to see the falls. We didn’t expect it to be so awesome. I didn’t realize that we went right underneath the falls. That water is powerful! Looks like so much fun! We have some similar tours in Acapulco but I haven’t gone yet. This might convince me. Great video. Nice! I’ll have to come to Acapulco to do that! we had so much fun, I’d do it again and again!